My friend Courtney brought dinner over this week since she knows I need a forced break from cooking. It was such a treat to have a delicious dinner dropped off and ready to throw together. She made Lettuce Wraps for us because it's one of her favorite and regular dinners. I've never made them before but after tasting them I know why she makes them all the time. I will definitely add these to our rotation for an easy and healthy dinner. I had leftover Somen Noodle Salad and cabbage for Cabbage with Hot Sauce so I served those with the Lettuce Wraps. What a perfect dinner! Stir together soy sauce, wine, red pepper flakes, ginger and garlic. Set aside. Dice celery stalks and water chestnuts into small pieces. Brown the ground chicken, breaking the chicken into small pieces with spoon. Season with a little salt, pepper and garlic salt. Once the chicken is halfway cooked, add the celery and water chestnuts. After a few minutes, add the sauce. Continue to cook and stir until chicken is cooked through and well mixed with sauce. 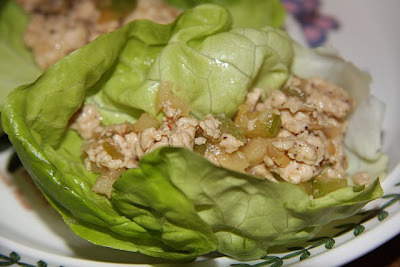 Put in a bowl and serve along with the lettuce. Perfect dinner for two. Double the recipe if you want leftovers.